PSI want a piece of that cake..rather the whole cake..I can share e-shopping options with you (wink wink). 😀 😀 I am roman nose .. and i made a pugged nose 😀 ..I’m straight and silky long hair .. I made curly quite shorter hair.. still if you all relate me to the expert .. I feel blessed 😀 .. I wish I were such an expert.I would have grabbed the job right away !! 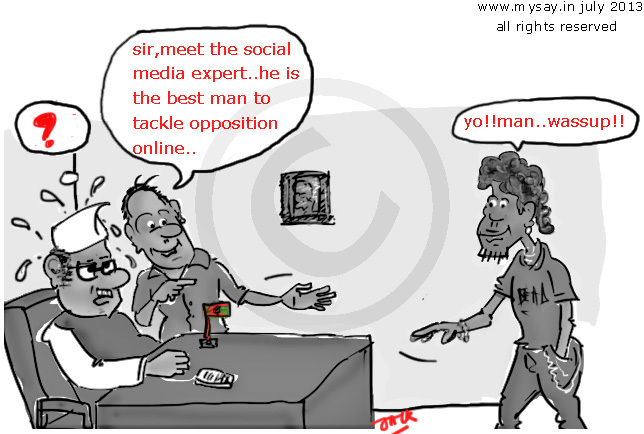 Better way to tackle politics…online wars! Kya yaar…jisko paise mil sakte hai, woh interested nahi hai aur jo interested hai, uske pass koi scope nahi hai…irony of life, isn’t it? I agree with Harsha…that’s the first thought that came to my mind when I saw the doodle….self inspired, is it? On second thought you PR is really good…I can see the way you handle comments on your blog!! !